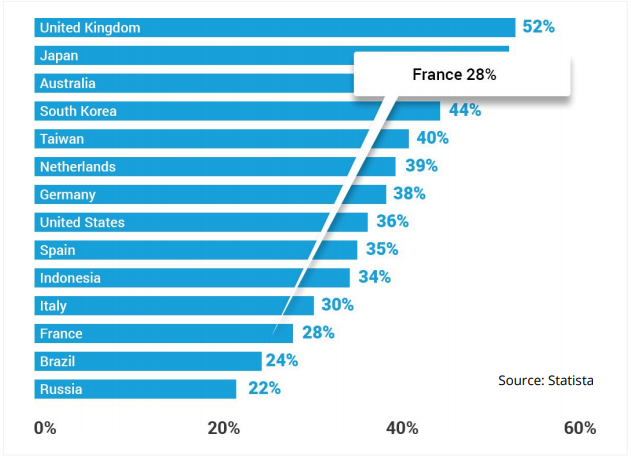 France is the third largest ecommerce market in the EU and 6th in the world. It can be characterized by high internet penetration, a large and diverse consumer base, growing mobile services, a modern delivery structure and plenty of opportunities for online sellers. 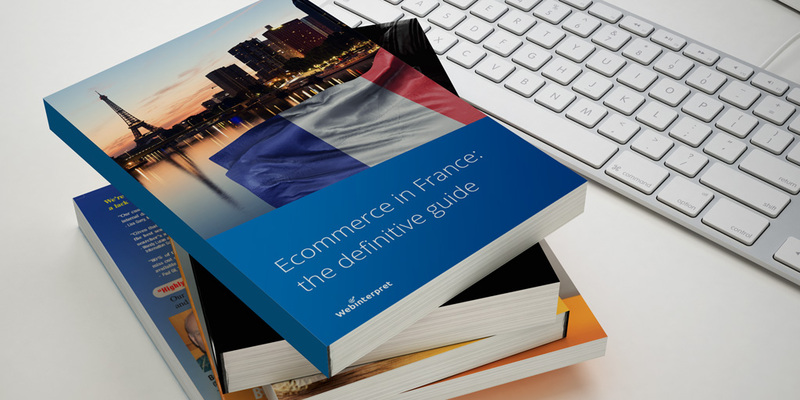 Interested in more ecommerce facts, figures and trends for the French ecommerce market? Read more and check out our comprehensive report! What comes to your mind when you think of France? Is it the French snacking on frog legs and snails and drinking loads of wine? Is it the Eiffel Tower and the city of love and romance? Or maybe you imagine well-dressed men and women who know what sophisticated fashion means? Talking about fashion… As you probably realize, it’s a very popular product category in ecommerce. It’s also the case in France … and we’re not talking berets here! The French consumer likes to shop for both chic brands and great bargains. 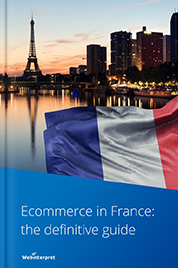 France is the third largest ecommerce market in the EU and 6th in the world. This is all great news for all international sellers interested in international growth opportunities. Here’s our comprehensive guide to the French marketplace: check our facts, figures and forecasts for the future. 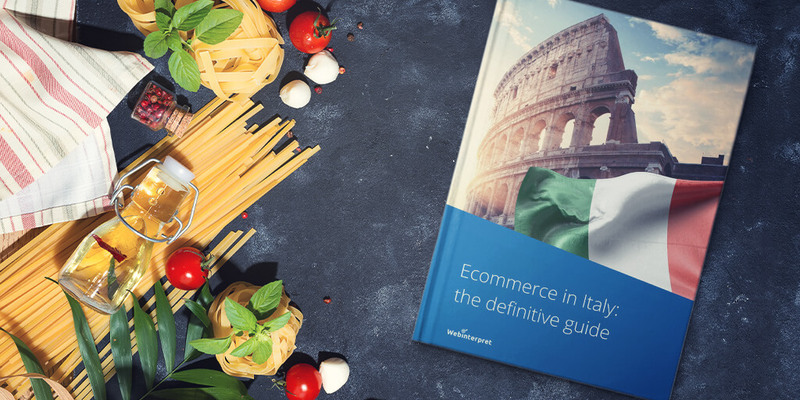 If you’re interested in comprehensive, quality data about ecommerce topics of your interest, we have more free guidebooks for you! In general, the French marketplace can be characterized by high Internet penetration, growing mobile services and a modern delivery structure. The market is relatively mature, but still full of opportunities for online sellers. Among other things, it can boast a large and diverse consumer base, high purchasing power, reliable payment methods, great location and the widespread use of the French language. At the moment French ecommerce mostly consists of either large retailers or small merchants, which contrasts with with the UK or Germany where mid-sized sellers are more common. Online sales are rising quickly in France, but physical stores still play an important role in retail. Thus, many online retailers have physical shops, which is helping them develop multi-channel strategies. Two-thirds of the French population shopped online in the last 12 months (as of 2016). Surprisingly, according to one study, most aren’t millennials as one might suspect. The age of a typical ecommerce shopper in France is 35 to 49, followed by 25 to 34-year olds. Online spending typically rises at the end of the year, with around 20% of the country’s total digital retail sales attributed to holiday shopping. French online buyers are usually tech savvy and confident in online shopping. As customers, they appreciate respect, politeness, clear information and a prompt delivery of service. However, social customer service still seems to be in its infancy. 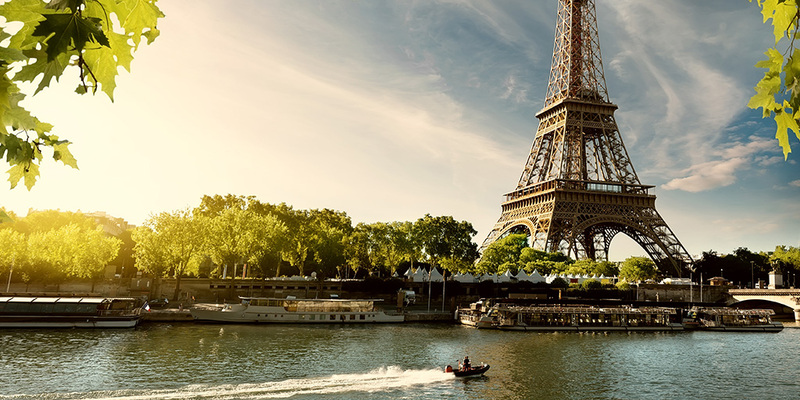 Price is a key factor for many French buyers, especially since the global economic downturn. According to Euromonitor, 80% of French consumers compare prices before buying non-grocery products. This has helped to fuel the growth of flash sales. In fact, France’s vente-privee.com is the world’s biggest flash sale site. If you’re an international online merchant who wants to sell in France, it’s important that you translate and localize your online store. It’s also important to interact with French-speaking consumers in their native language. Among other things, overcoming the language barrier will definitely make the purchasing process more straightforward for French-speaking consumers. There are further benefits. 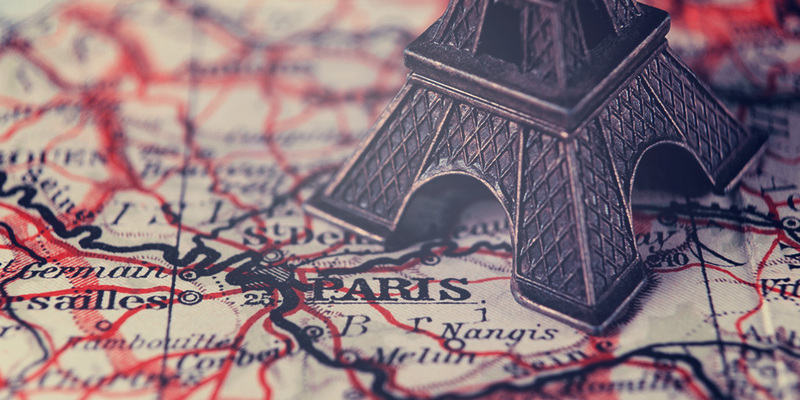 The French language, the sixth most widely spoken language in the world, is used not only in France, but on five continents. This can provide international online sellers with extra opportunities, e.g. the possibility to reach millions of consumers in Belgium, Switzerland, Canada, and in Francophone Africa. Among the top products purchased by French online buyers are clothing/footwear, books, home electronics, cosmetics, haircare and skincare and children’s items. New logistics approaches, e.g. free delivery and returns, unlimited delivery subscriptions or pick-up lockers, contribute to ecommerce growth in France. This is encouraging for cross-border retailers thinking of entering the French market. However, the French are demanding when it comes to delivery and they expect it to be utmost convenient. Thus, retailers should prioritize consumer convenience when providing delivery options. Offering a choice is crucial here, along with reliability and speed. The preferred delivery method is home delivery (83%), followed by shipping to a pick-up & go location (66%) and delivery in store (26%). Pick-up points close to consumer homes are very popular among the French, e.g. at local stores, post offices or in lockers at train stations. The main postal service in France is called La Poste (historical postal operator), Collissimo is used for parcels and Chronopost for express deliveries. La Poste, Collissimo and Chronopost are recognized and trusted brands in France so it’s recommended to provide French consumers with these delivery options on your website. This way, they’re more likely to put trust in your business. According to UK’s Royal Mail’s research, reassurance about delivery, tracking goods and receiving all the relevant information are very important in France, even more so than in the UK. 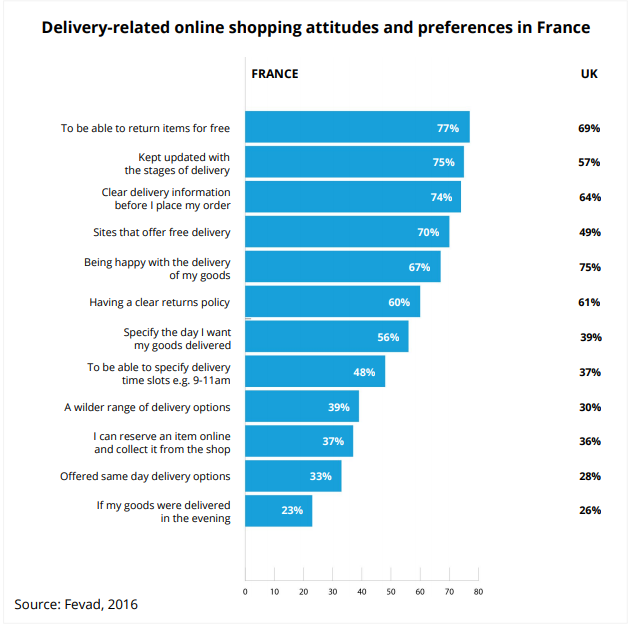 85% of French would be happy to track every order, rather than rather than just high-value items, compared with only 60% in the UK. One of the biggest challenges for retailers may be differing customer expectations: some want one-hour delivery slots, others might want to have their product delivered to a secure locker and so on. Adrien would recommend shipping goods directly from the country of origin or using marketplace fulfillment & logistics solutions, e.g. FBA. The majority of standalone logistics companies are not able to offer competitive shipping rates. A good alternative is fulfillment done by cDiscount, which enables you to fulfil orders from any sales channel at an extremely low price. This marketplace also drives very high traffic. It’s worth noting that there’s a benefit to importing goods into France. That’s because in some cases de minimis value (the threshold from which the imported goods are subject to duties) can be higher than in other countries. This facilitates importing higher value goods into France. In France, credit and debit cards (57%) are the most popular payment method for online purchases. They’re followed by PayPal (25%) and bank transfer (9%). Over 50% of all online customers in France use Cartes Bancaires (payment cards). Thus, if you want to sell in France and maximize your conversion rates at the checkout, include Cartes Bancaires along with other popular payment cards, such as Visa, Mastercard or American Express. French consumers are comfortable using mobile devices, yet compared to other market leaders, they seem to lag a bit behind. Currently, relatively few retailers offer multi-channel purchasing solutions. The mobile share of retail ecommerce sales in France amounts to 28%, which is relatively low compared to the leader, i.e. the UK (52%). It may seem surprising that although France is the third ecommerce market in Europe, it ranks in sixth place when it comes to shopping on mobile. This doesn’t mean, however, that online sellers can cut some slack when it comes to mobile optimization. Quite the contrary, the overall trend indicates a significant increase in the use of mobiles for shopping purposes. Thus, retailers must make shopping smart on mobile devices if they don’t want to lose a big proportion of potential buyers. According to Postnord, 52% of French online shoppers order products from abroad. Favourite online shopping destinations of French online buyers include the UK, China and Germany. First, the French language belongs to those languages which are spoken all over the world. This gives you an opportunity to access a big number of online buyers that are located in many countries beyond France and continents beyond Europe. Second, France is Europe’s third market in value, just behind the UK and Germany. With a turnover of more than 65 billion euros, France has a strong online retail position. The growing popularity of ecommerce is opening the country up to more competition, increasing opportunities for international retailers. Third, there are a large variety of marketplaces in France, e.g. Cdiscount, RueDuCommerce (Carrefour), fnac.fr, Spartoo (shoes), PriceMinister (Rakuten) and many more. These marketplaces are a good way to promote your products at a relatively low marketing cost. There’s also a wide range of products that can be offered to French shoppers, e.g. in fashion, furniture, travel, electronics or high-tech categories. Fourth, France’s location is beneficial with regard to (international) trade. It’s located in the heart of Europe and is also a natural crossroads for European and global trade. Further, the well-developed transport and technology infrastructure should make your online sales experience a smooth process. France has one of the best designed and most efficient transport networks in the world. For instance, you must have heard about the high speed train networks, such as the French TGV, offering super-fast journeys between France’s major cities and many European capitals. In addition to the advanced train infrastructure, there are also roads, motorways and waterways, which facilitate domestic and international trade. To add to this, French consumers are becoming increasingly connected. Mobile commerce sales have recently increased by 30%, so tap into this growing sales potential. Finally, future shopping may offer some potential for all online sellers who want to make creativity one of their unique selling points. There’s a lot of research and experimentation. Some see the shop of the future as a combination of shopping spaces combined with cultural places or inspirational learning spots. Some French consumers would like to see a personalized interface and enjoy a personalized user experience. This can be one of the main challenges for online retailers. The main issues around a lack of time and skills can be remedied by automated solutions. Further, the three buying criteria (delivery, price and product) that French consumers see as the most important can make it challenging for retailers to provide the impeccable buying experience many French customers expect. Additionally, it’s crucial to meet the delivery expectations of those French online buyers who expect utmost convenience, speed, reliability and regular reassurance about the whereabouts of their parcels. Due to differing customer expectations, you’ll be probably required to offer multiple delivery options. Doing business in France is worth considering for international online sellers. This is a country with a convenient geographical location and a marketplace where ecommerce continues to grow in strength. Being one of the key ecommerce players in Europe, France is high on the list of prospects for sales success. Healthy competition, good infrastructure and a population that loves shopping all make it a promising destination for online merchants. The online sales landscape in France has a lot of things in common with other European markets, so if you sell in Europe already, this should make things a whole lot easier. However, don’t overlook the many unique characteristics of the French marketplace, especially in terms of consumer demands, price competition and multi-channel retailing. Plan your business expansion in advance and start selling online in France! To access the FULL report, click below to download it for FREE! Lengow Country Guide. 2016. France. Ecommerce Outlook.